SAN DIEGO, CA--(Marketwire - January 20, 2011) - Cytori (NASDAQ: CYTX) received approval from The Netherlands to initiate a pivotal European trial, named ADVANCE, to investigate adipose-derived stem and regenerative cells (ADRCs), processed by the Celution® One System, in the treatment of patients with acute heart attacks. This is the first country and trial-center approval for ADVANCE. Additional country and trial-center approvals are anticipated throughout Europe during the first half of 2011. One of the goals of the trial is to expand the Celution® System CE Mark to include acute heart attack claims and to provide economic data to justify its implementation and reimbursement. ADVANCE is a randomized, placebo controlled, double-blind trial that will enroll up to 360 patients with ST-elevation myocardial infarction in up to 35 centers, predominately in Europe. The primary endpoint of the trial is reduction in infarct size as measured by cardiac magnetic resonance imaging (MRI). ADVANCE will use the Celution® One, our next generation device manufactured by Olympus-Cytori Joint Venture. The Celution® One System draws on the same core technology and scientific innovation as the Celution® 800 System, which is currently approved in Europe for breast reconstruction, certain aesthetic procedures and specific types of wounds. The Celution® One System is an investigational device that is not yet commercially available. 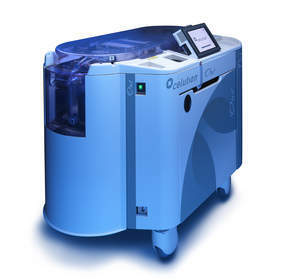 The Celution® One System is specifically designed for use in a hospital setting, processing greater tissue volumes in less time. In 2010, Cytori reported results from the APOLLO trial, a pilot study for acute heart attack patients who underwent ADRC therapy. The study showed that the harvest and injection of ADRCs were safe and well-tolerated in this patient population. At 6 months, the procedure was associated with an improvement in infarct size in ADRC-treated patients, as well as in other measures. Olympus-Cytori, Inc. is a joint venture between Olympus Corporation and Cytori Therapeutics, Inc. that was formed in 2005 to develop and manufacture future generation devices (based on Cytori's existing Celution® System) that will process and concentrate adult stem and regenerative cells residing in adipose tissue. The alliance creates valuable synergies between two companies that share the same vision for regenerative medicine. Olympus, as a leader in the development of innovative medical products, contributes its expertise in engineering, manufacturing, and quality assurance of sophisticated devices. Cytori's focus is dedicated to the development and commercialization of therapeutic applications using adipose stem and regenerative cells in multiple large medical markets. Olympus-Cytori is establishing the premier brand of point-of-care cell therapy devices in the emerging field of regenerative medicine. This press release includes forward-looking statements regarding future events and expectations, including but not limited to Cytori's ability to gain the necessary additional trial-center approvals for the Advance trial, and the ability of the Celution One system to perform in accordance with its specifications within the Advance trial. These forward looking statements involve risks and uncertainties, including the Company's ability to satisfy the requirements of various local regulatory authorities, the Company's ability to manage a large multi-center, multi-regional complex clinical trial, and the capability of the Celution One device to perform successfully in the clinical setting, as well as other factors which may be beyond the Company's control. For additional disclosure regarding these and other risks faced by Cytori Therapeutics, we refer the reader to carefully review the section titled "Risk Factors" in Cytori's filings with the SEC, including its annual report on Form 10-K for the year ended December 31, 2009 and subsequent quarterly reports on Form 10-Q. Cytori assumes no responsibility to update any forward-looking statements contained in this press release to reflect events, trends or circumstances after the date of this press release.